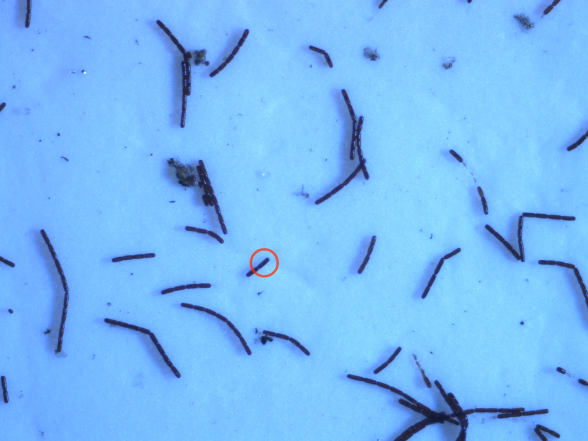 You study microbial communities living on surfaces of glaciers and have spent time from July to mid-September at Tarfala Research Stations during your field study at the Storeglaciären glacier. Tell us more about your research project! 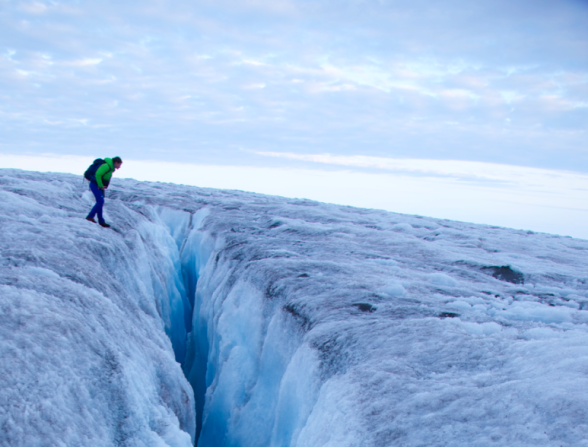 Glacial melt is a major 21st century problem. Ice algae (Zygnematophyceae) are exasperating this rate of melt by growing on glacial surfaces. These brown pigmented cells darken the ice, reduce reflectivity, and consequently enhance the amount of solar energy absorbed, which ultimately increases surface melt. Algal cells are living, dynamic systems, which interact with, and react to, their environment. So changes to their physicochemical conditions will likely influence their distribution and function; potentially altering their melt effect. If we are to make robust projections of future glacial melt, then the ecology of these surface ice systems needs to be better understood, so that it can be worked into more advanced surface mass balance models. My research aims to address the current ecological knowledge gap by studying the relationship between the form and function of ice algae and their surrounding climate. Karen peering into a crevasse which highlights the contrast between dark algal colonized ice on the surface and clear algal-free ice within the fracture. Photo credit Sara Penrhyn Jones. Have you results already that you can give a small glints of? Sadly not! When I work in the field it’s all about collecting snapshots of microbial communities, preserving them in that state as quickly as possible, and storing them in a stable condition until we can transport them home. Not much else can be done in the field for the analyses that we want to pursue. In our home laboratories we have access to equipment that allows us to peer into their molecular biology, providing us with insight into who they are and what they are doing. In the field, the only results we obtain are cell counts; but this shows us very little on its own without parallel data. We do get to see lots of very pretty algal cells when we are counting though!! Ice algae viewed under a microscope at x10 magnification. A single cell is highlighted by a red circle. Why did you come to Tarfala Research Station? Tarfala was a really great location choice for this project for several reasons. Firstly, and most importantly, anyone who’s spent much time here will know that it can be a very wet and cloudy place. Despite this being a little unpleasant to work in, the long-term project plan is to compare communities sampled from these conditions to other glaciers that typically have more stable weather, so Tarfala was a great natural laboratory for us. Secondly, the proximity of the glacier to the research station really helped us in achieving all our research goals; it meant that even in some of the most horrendous weather it was still possible to head out, take samples and get back to the warmth of the station within three hours. We were also extremely grateful of this short walking distance when we had to haul heavy bit of sampling kit up to the field site! Finally, Tarfala has really fantastic logistical support and facilities. Getting to the research station is relatively simple, and once we were there, the most important part of our research (processing and storing samples) was very easy to do thanks to the space and equipment available. 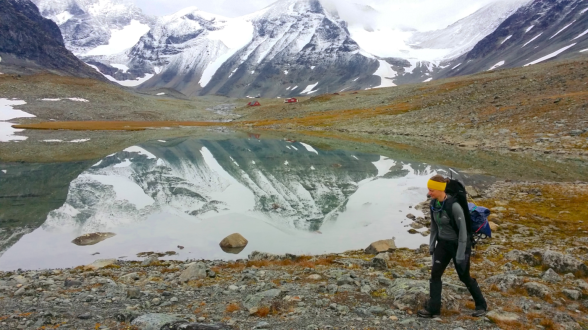 Karen on her daily walk towards Storeglaciären with Tarfala Research Station in the background. Photo credit Michael Gardner. SITES makes a lot of terrestrial and limnologic research infrastructure happen, what has the infrastructure at Tarfala meant to you in your research project? The SITES infrastructure available in and around Tarfala will undoubtedly be key to the project!! There’s a weather station on Storeglaciären, about 200m from where we were working, that will provide us with all the solar, precipitation and snow depth data that we need. Complementary data from closer to the research station will also be useful to have as a comparison. Any changes in the ecology that we see will be correlated to environmental changes that are measured at these weather stations, so this data will become central to the project as it progresses. In addition, Tarfala boasts a long history of mass balance and climate records from the surrounding area, which is really great for providing foundation knowledge and for obtaining a better understanding of this system. 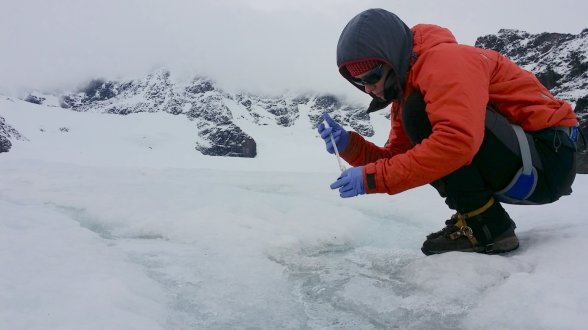 Karen sampling surface ice communities in early September as the glacier melt slows for the season. Photo credit Michael Gardner. How long did you stay and how was your time there? All in all, we were at the station for a little over a month this year, spread across two visits. Our first stint was for all of July. We then returned at the end of August until the beginning of September, for some late season sampling as a comparison. It was a strange year for sampling, with lots of snow persisting late into the year. This snow prevented us from getting on with sampling, so we tried to hurry the melt along by digging down to the ice surface; but this proved to do little other than keep us fit, warm and amused while we waited for the sun to do the job properly!! As soon as the ice surface was naturally revealed we embarked on a non-stop carousel of sampling in the morning, and processing in the afternoons and into the evenings. Thankfully there was always time for a relaxing sauna before bed; which should surely be listed as one of the main reasons we came to Tarfala! We worked really hard this field season, so fingers crossed that we will be rewarded with some great results to match our efforts. You can read more about some of the work and adventures over our 2017 season in our INTERACT blog - Arctic Research. The project spanning spring, summer and autumn. Left to right: Aliyah Debbonaire shows deep (50-80 cm) snow in early July; summer flowers line the route out of the Tarfala Valley at the end of July; and autumn colors flood the valley floor with dustings of snow on the summits in early September. Karen was interviewed in October 2017 by Ida Taberman. Karen has taken all pictures unless otherwise stated.